Moshe Hammer has been a violin teacher and a chamber-music coach to hundreds of students in Israel, Europe and North America. 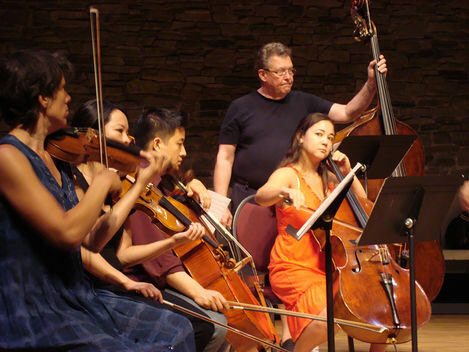 With wide-ranging experiences, he has developed a unique way to train students to reach their highest level of musical, technical and artistic excellence. And sometimes it happens over a relatively short time. Young professionals from Europe and The Americas have traveled to work with Mr. Hammer in preparations for concerts, auditions and other special events. Moshe Hammer has been a violin teacher and a chamber-music coach to hundreds of As communications technologies continue to improve you can take advantage of Mr. Hammer’s coaching in real time, regardless of the distance. "Our daughter has been taught by Moshe Hammer via Skype. The progress is clear: Mr. Hammer listens and watches her play and offeres valuable comments; both general and specific, that made her improve. Our daughter loves Mr Hammer's coaching, because of his approach with a serious tone but still with warmth and humor. He speaks about how to understand the piece and helpes her to solve some problematic passages. 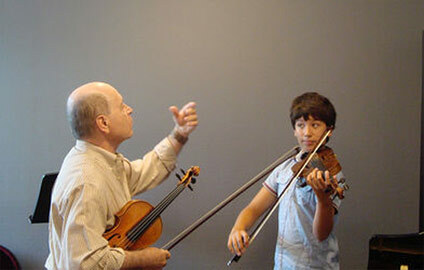 Because of his knowledge of the repertoire and his capacity to analyze the skills and flaws of a young violinist, he offers concrete help and an inspirational boost. Quite special to be able to profit from someone so experienced and so far away." Contributed with pleasure by Mentel - © 2019 Copyright Moshe Hammer.